in the news, so one of those tried was sci-fi/space adventure, such as Harvey Comics' Race for the Moon, Charlton's Outer Space and, most successful of the lot, DC's Adventures on Other Worlds, where the star was Adam Strange. All three appeared within a year of Sputnik. Another of that vintage was a little less serious in tone, but every bit as adventurous. Archie Comics, publisher of Katy Keene, Li'l Jinx and (of course) Archie himself, launched Cosmo the Merry Martian (no relation) with a cover date of September, 1958. It isn't known who wrote the story, but the illustrator was Bob White, whose other credits include Pureheart the Powerful, Tippy Teen and The Fly. And that's not all! The story was continued in the next issue, and the next, and so on. Before long, Cosmo and Orbi were joined by Cosmo's girlfriend, Astra, also using a Thimk-designed spaceship. They lurched from one adventure to another, a cliffhanger in every chapter, visiting planet after planet. It may not have been very hair-raising, but it was certainly fast-paced. It was also fast over. The title lasted six issues, the final one dated October, 1959. Like all the rest, it ended with a cliffhanger. 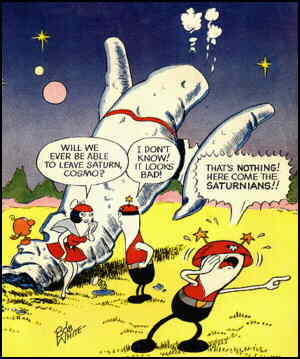 Cosmo was never seen again, except in occasional reprints, usually in digest form. But he's well remembered. Like Herbie and Kona, Monarch of Monster Isle, comic book fans and professionals who were kids when he was current are still talking about him. Text ©2005-06 Donald D. Markstein. Art © Archie Comics.